Responding to a “Shots Fired” dispatch, officers first converge on this market, in the Lents neighborhood. The parking lot of the building seen behind the market, Johnson Creek Village Apartments, was said to where a gun was discharged. Emergency dispatchers sent a cadre of Portland Police Bureau (PPB) East Precinct officers on a “Shots Fired” call to the Checkers Market, at the intersection of 92nd Avenue and Flavel Street, at 4:07 p.m. on February 7. “There was some kind of shooting, but it wasn’t at our corner market,” remarked neighbor Tawanja Baxter, as she looked at the eight police units stopped west of the market. Entrance to the entire frontage of this apartment complex is closed off with police tape, as the shooting investigation gets underway. 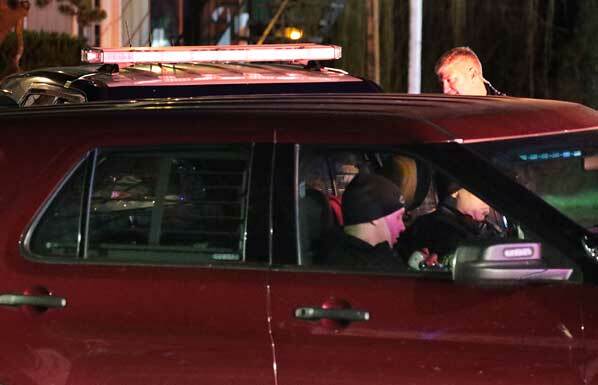 “It wasn’t a holdup or anything like that,” Baxter told East Portland News. 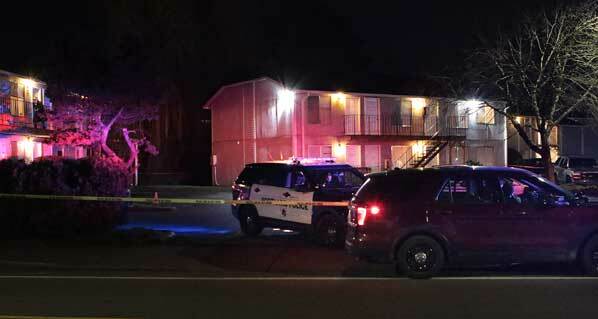 “So, what I know is that there was some kind of squabble going on in a unit at the [Johnson Creek Village Apartments] apartments, and someone shot a gun. “Then, a woman – somehow involved in this shooting – ran to the market, and they called the police,” Baxter said. 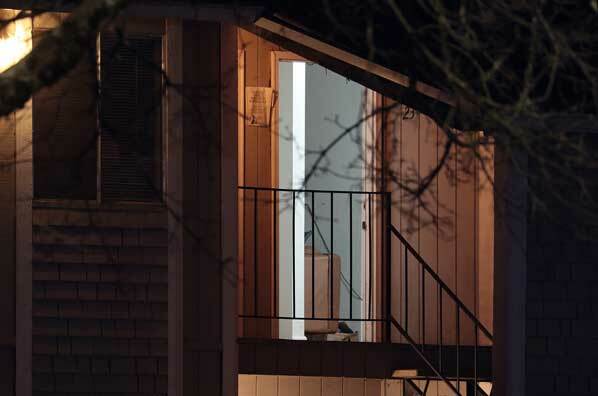 A neighbor points out the open door to an apartment unit, saying that the suspect had been in this unit before firing a gun at a car in the parking lot. 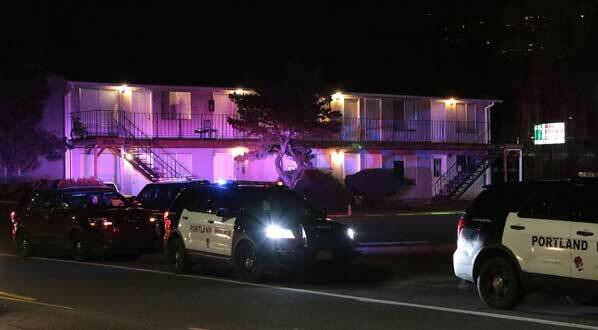 For hours, police tape blocked off the entire frontage of the apartment complex; units were parked both inside the perimeter, and out in the 9000 to 9100 block of Flavel Street. 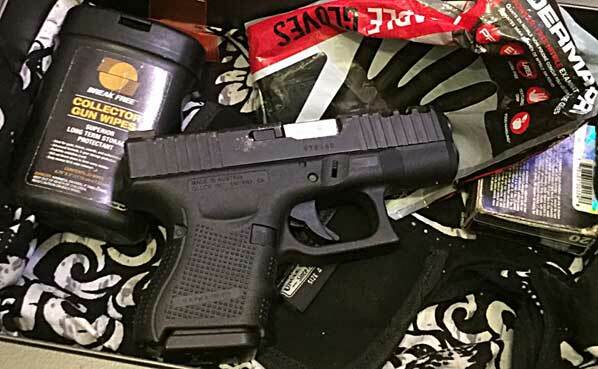 “As the officers were arriving, a woman matching the suspect description walked out, and was arrested,” reported PPB Public Information Officer Sgt. Kevin Allen, who is with East Precinct. Officers confer about the incident; one person is arrested. 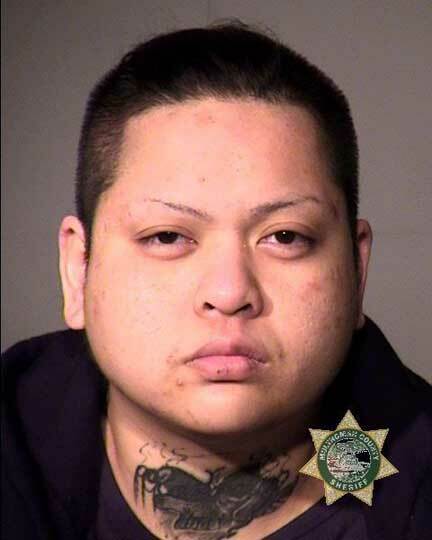 Officers arrested 31 year-old Lena Thi Son, who was booked into the Multnomah County Detention Center (MCDC) at 11:50 p.m. that evening on charges of Felon in Possession of a Firearm, and Unlawful Use of a Firearm, both of which are Class C Felonies. After her arraignment in Multnomah County District Court the following day, Son learned that she would face both charges; she remains in MCDC in lieu of $10,000 combined bail.